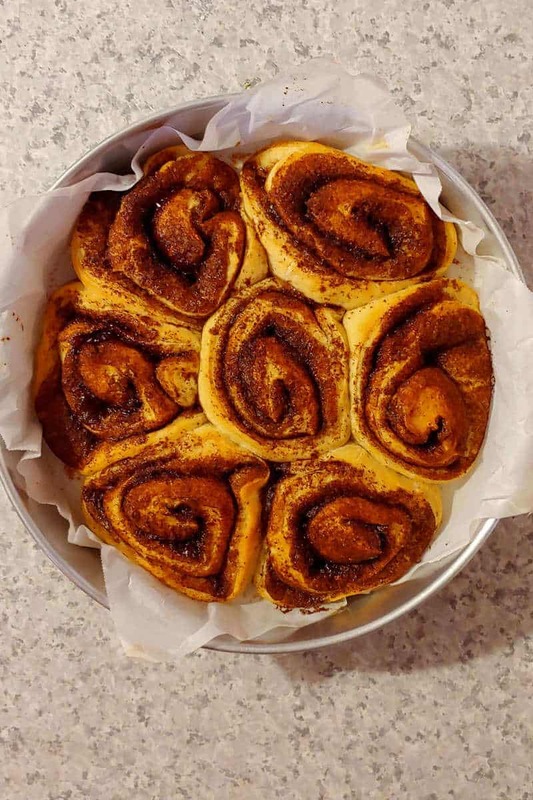 I love cinnamon rolls – but only homemade ones. I’ve seen too many very dark cinnamon rolls in bakery cases, ones where I know that even reheating (who wants a cold cinnamon roll?) will not make it worth eating. So I love making them at home. What I don’t love is waking up 4 hours before I want to eat cinnamon rolls. 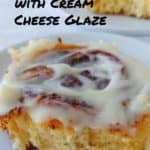 So I’ve taken this wonderful recipe for cinnamon rolls with cream cheese glaze that I made back in 2011, and adapted it with two different make-ahead options. I can make them the day before, so I can just pop them in the oven, or I can make them, freeze them, and bake them whenever I want them! Why do I enjoy these cinnamon rolls so much? They’re soft and tender. They have just the right amount of cinnamon sugar in the center, and brown sugar in the filling adds a little extra flavor. 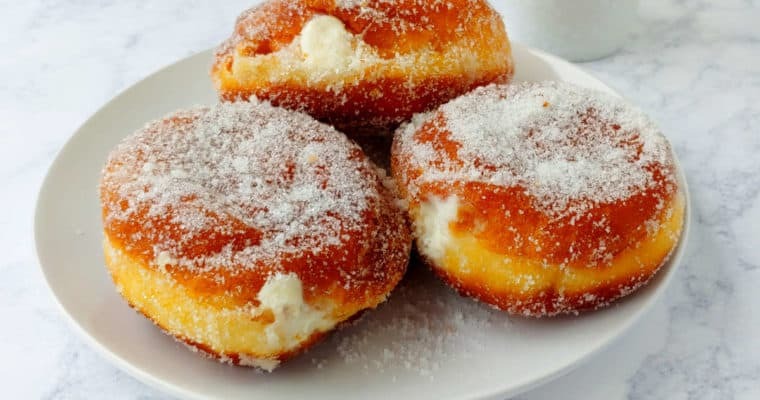 There’s just the right amount of cream cheese glaze on them. These cinnamon rolls aren’t excessively sweet. No, it’s not healthy, but these rolls are not so rich that you crave something salty afterwords. They’re perfectly balanced. I first made these cinnamon rolls toward the end of January 2011 for a welcome-back brunch at work. This recipe makes 18 rolls, which is really too many for a family of two to eat. This was just after I ended my 365 Recipe Challenge, so I was still pretty ambitious and willing to make recipes I hadn’t gotten to in 2010. What I found as I looked for something to take to work was Cinnamon Rolls with Cream Cheese Glaze; it looked infinitely manageable and would yield lots. Of course, I originally found the recipe on Smitten Kitchen. 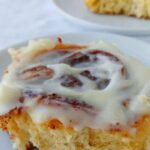 I have a few other cinnamon roll recipes on this website, but this one is what I’ve recommended to others recently. One recipe comes from The Bread Baker’s Apprentice (affiliate link) and I like it, but it calls for lemon extract and zest and I need to retest it and make a few adjustments to get it how I want; that said, the dough bakes up like a dream. The other is Alton Brown’s Overnight Cinnamon Rolls, which I recall is also fantastic, but I haven’t tried since 2010. 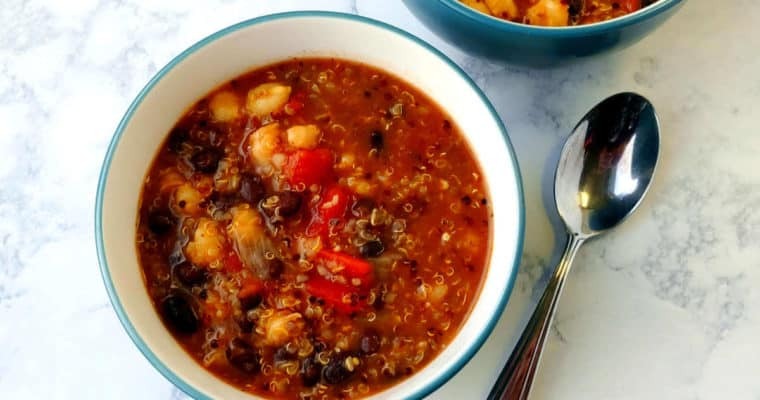 I commented when I originally wrote this post that this recipe is easier than Alton Brown’s. Making cinnamon rolls is not a quick process, but it is well worth doing. You get a ton of cinnamon rolls, and your house smells amazing. And the cinnamon rolls are so much more delicious than what you find at the store. First you make the dough. Heat the butter and milk, and then mix with flour, sugar, yeast, salt, and an egg. I used my stand mixer to do this (as always), but the dough is soft enough that it would be easy to knead by hand. You’ll mix and knead this dough anywhere between 7-12 minutes, maybe a little more if you need to add flour to get the dough to the right consistency. Let your dough rise in a warm place for about 2 hours, until doubled. My go-to is preheating my oven for 1 minute, then turning it off and stashing my dough in there. This is an especially good strategy in winter when your kitchen is cold. Next, you turn the dough out onto a lightly floured surface. Since the dough is soft, it’s very easy to roll out into a 11×15-inch rectangle. 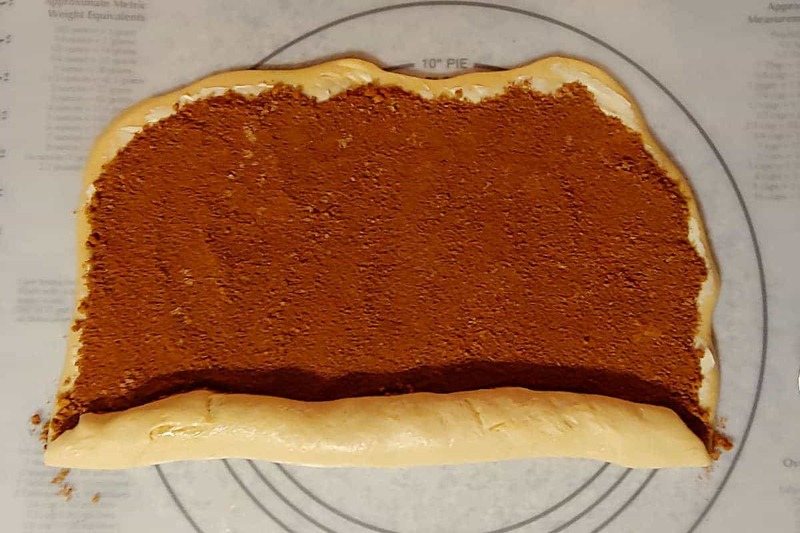 Next, spread softened (but not melted – that’s a mess) butter over the dough, leaving a 1/2 inch border along one long edge. Sprinkle a mixture of brown sugar and cinnamon over the butter. It’s a little cumbersome to roll up such a long, soft roll of dough, but do your best. 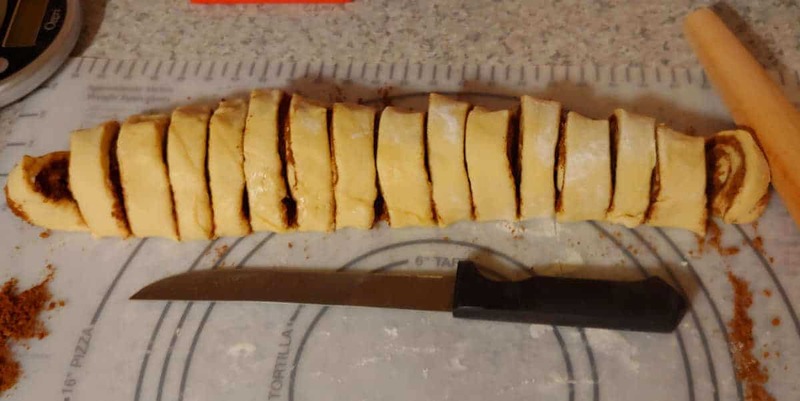 Stand along the long and sugared side of the dough and roll it up, pinching the edge of the roll into the log to seal it. Cut the dough into 18 slices. Use a serrated knife and cut in a sawing motion. Knives that are not serrated will squish the dough. Place the rolls in a greased or parchment-lined 9×13-inch pan, or two 8- or 9-inch baking pans. They’ll be a little cramped in a 9×13-inch pan, but they will rise upward instead of outward and still bake fine. Cover them with plastic wrap and let rise until doubled. This will take 45 minutes in a normal kitchen, almost 90 minutes in a cold one if you don’t create a warm spot for dough to rise. Put the doubled cinnamon rolls in the refrigerator at this point. The next morning, take them from the fridge and let them come to room temperature for 20-30 minutes while you preheat the oven. If you want to bake the cinnamon rolls another morning, place the doubled cinnamon rolls in the freezer. Freeze until frozen. I often forget them overnight, but I guess this would take about 4 hours. If your rolls are in parchment, take them and the parchment from the pan. If they’ll fit inside a freezer bag, place them inside and squeeze as much air as you can from the bag before sealing it. If you’re freezing your rolls in the pan or they won’t fit in a bag, wrap them twice with a length of plastic wrap – once from each direction. Use tape if necessary to help seal it. If you’re not confident about how well the plastic will hold, wrap a third time in a layer of aluminum foil. Whichever you do, be sure to write on the package the date and how to bake it. Remove the rolls from the freezer the day before you want to bake them and thaw them in the refrigerator. Place the rolls in the pan you will bake them in. Cover them with plastic wrap, but be sure that it’s not touching the rolls. If your pan still fits in the freezer bag, you can leave the rolls and pan in there, but again, be sure the plastic isn’t touching the rolls. After your cinnamon rolls have thawed in the refrigerator, bring them to room temperature for 20-30 minutes as the oven preheats. Bake your cinnamon rolls at 375F for about 20 minutes, until the edges turn golden. 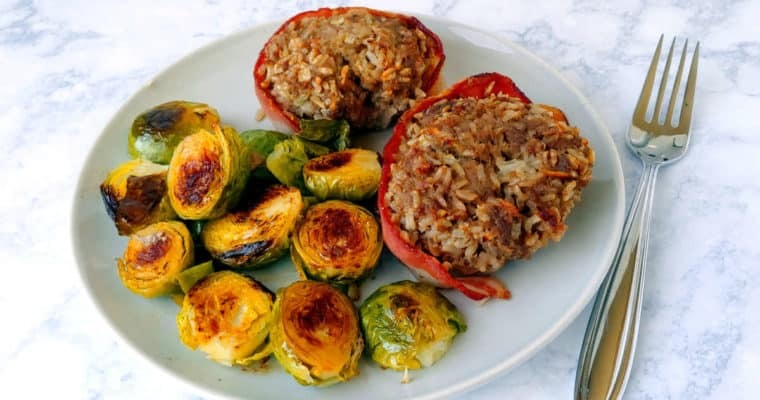 This may take a few more minutes for rolls that have been stored in the refrigerator or freezer. Top your hot rolls with the glaze almost immediately. 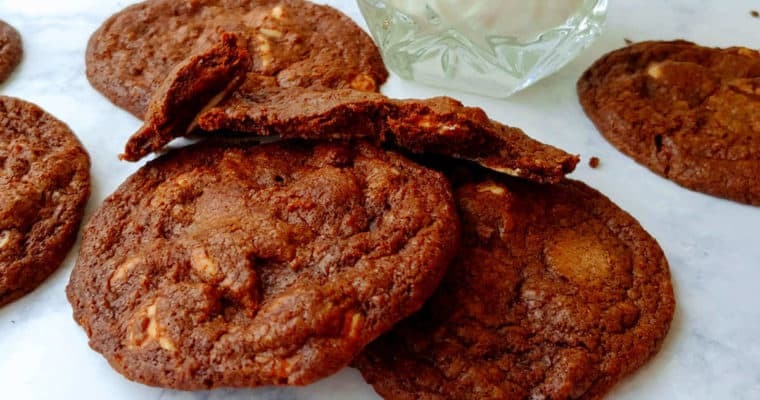 The recipe originally recommended serving at room temperature, but I think they’re best warm. 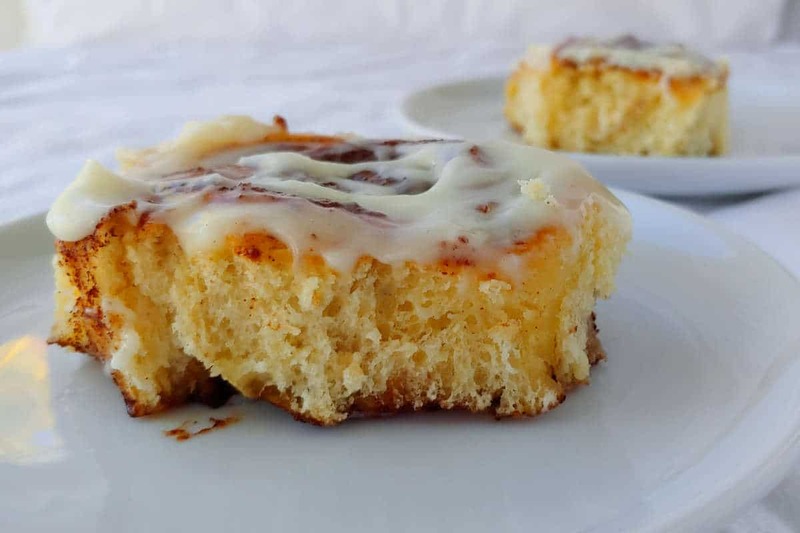 Honestly, these (and most) cinnamon rolls are best the day they’re made, particularly if you don’t eat them warm. I store my leftovers in a container in the fridge (since they have cream cheese glaze). Reheat them straight from the fridge for about 15-30 seconds, maybe a little more, in the microwave. DO NOT OVERHEAT. If you do, they will become hard and not pleasant to eat. The best thing to do is to figure out how many your family will eat. Make that many, and freeze the rest of the rolls before baking as I’ve described as above. 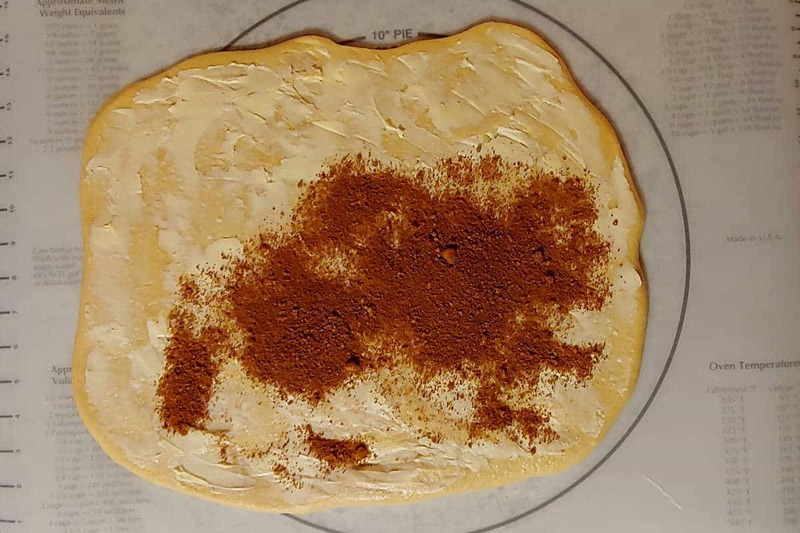 Want to compare this recipe to other cinnamon rolls? 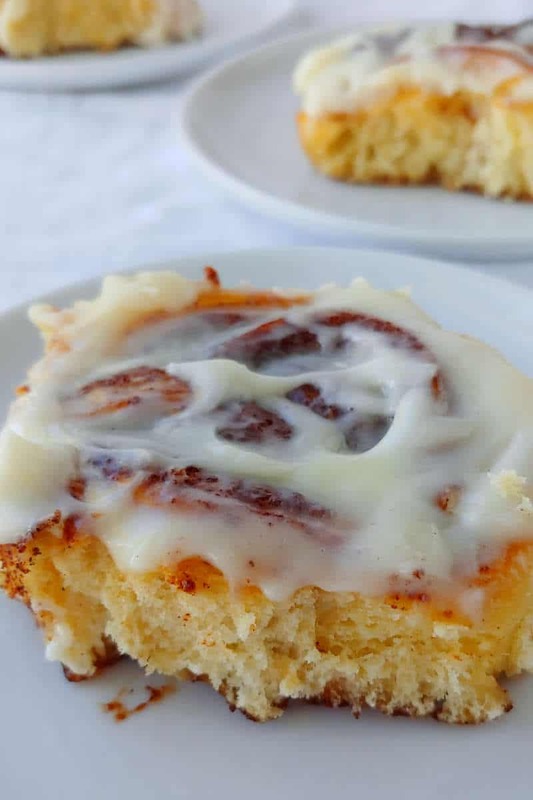 You can try these cinnamon rolls adapted from the Bread Baker’s Apprentice (affiliate link); these overnight cinnamon rolls adapted from Alton Brown; these super-tender, quick and easy cinnamon rolls that you can make in about an hour; or these gluten-free cinnamon rolls if you need to make something gluten-free. 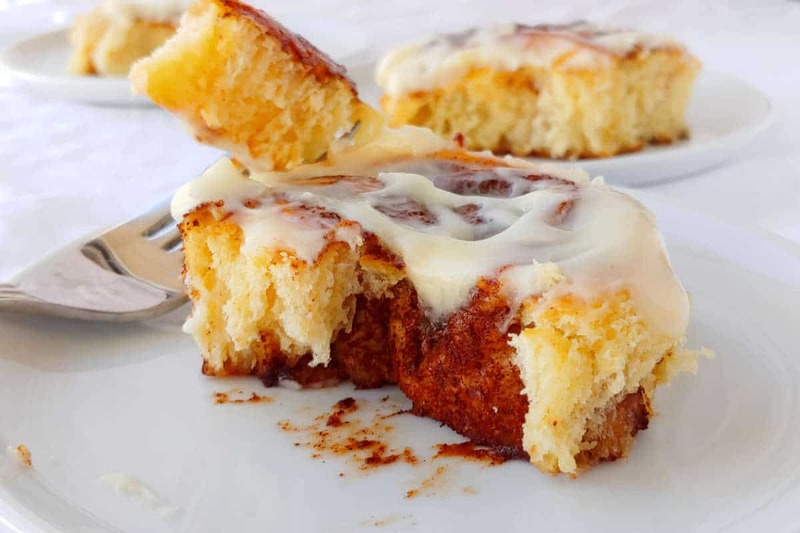 This delicious recipe for cinnamon rolls with a cream cheese glaze is easy to make ahead. Shape the dough the night before you want them, refrigerate them, and bake them the next morning. Add remaining flour and beat on low to mix. The dough should be sticky. Knead longer on low, until dough is smooth and elastic. This took me 4 minutes in a stand mixer; may take 8 minutes if kneading by hand. If dough is too sticky, add more flour, one tablespoon at a time. The finished dough will be tacky, sticking to your fingers like a post-it note, without leaving much residue on your hands. 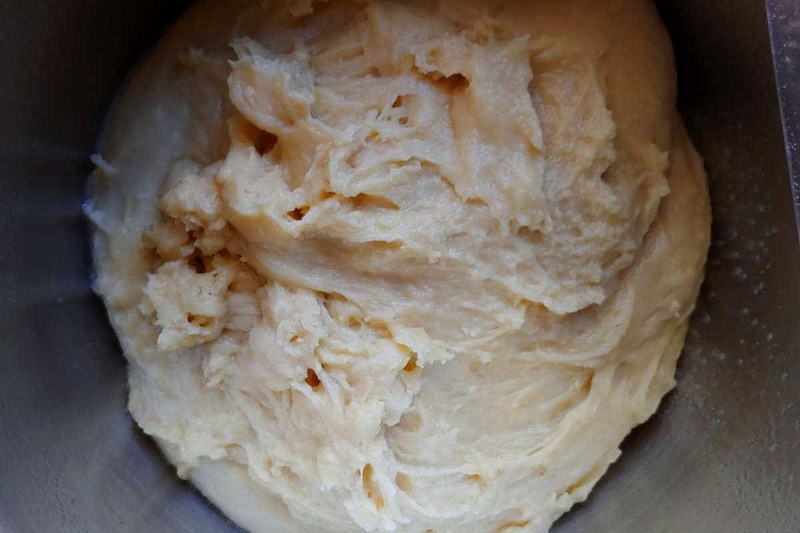 Place dough in a greased or oiled bowl. Cover bowl with plastic wrap. Let rise in a warm space until doubled, about 2 hours. Mix together brown sugar, cinnamon, and a pinch of salt. Set aside. Turn dough out onto a lightly floured surface. Roll out into a 15x11 inch rectangle. Spread 4 tablespoons of softened butter over the dough, leaving a 1/2 inch border along a long edge. Sprinkle cinnamon sugar over the butter. Facing the sugared long edge, roll the dough up in a roll toward the unbuttered border. Pinch the seam closed and place log seam side down. Use a serrated knife to cut log into 16-18 rolls (3/4 inch wide). Grease two 9-inch pans (or one 9x13-inch pan) well, or line with parchment paper. Place rolls cut side down in pans. Cover with plastic wrap, then let rise in a warm kitchen until doubled, about 45 minutes. 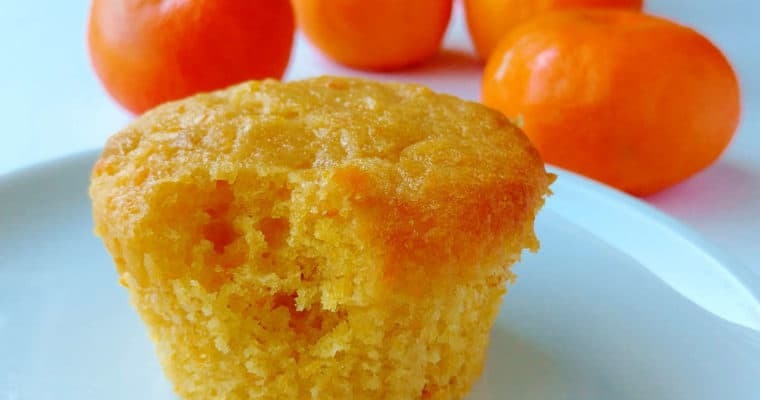 To bake these the next morning, place the rolls in the refrigerator after this rise. The next morning, pull them out for 20-30 minutes to let them come up to room temperature. However, be careful with this if baking in glass as the sudden change in temperature from cold fridge to hot oven can break the glass. Bake at 375F until the edges are golden, about 20 minutes. If they're browning too much, cover them or remove them from the oven early. (Their temperature, if you take it with a probe thermometer, will be around 195F when done.) Do NOT overbake. Combine softened cream cheese, powdered sugar, 4 tablespoons softened butter, and vanilla with an electric mixer, beating until smooth. Spread on rolls. Serve warm (my preference) or at room temperature. Store any leftovers in the refrigerator. After the 45 minute rise in the baking pans, place pan in freezer. Freeze until solid - about 4 hours. If using parchment in 9-inch pans, remove the rolls and parchment from the pan. Place in a gallon sized freezer bag. Squeeze as much air from it as possible. If freezing in the pan or the rolls won't fit in a freezer bag, wrap the frozen rolls/pan twice in plastic wrap. Use tape if necessary to help seal. A layer of aluminum foil over the plastic wrap will also help protect them from cold air. To thaw, remove rolls from freezer the day before baking. 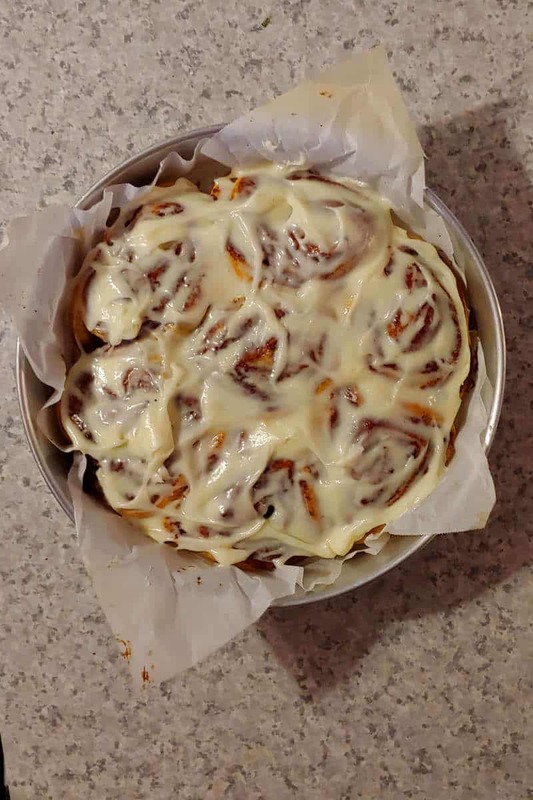 If rolls are not in a pan already, place them in a pan. Remove plastic wrap from top, and drape it loosely over the rolls so it's still covering the rolls/edges but not touching the dough. The next morning, remove rolls from fridge when you preheat the oven. Bake at 375F for 20-30 minutes; they may take a few extra minutes to cook, depending on how many you are baking. 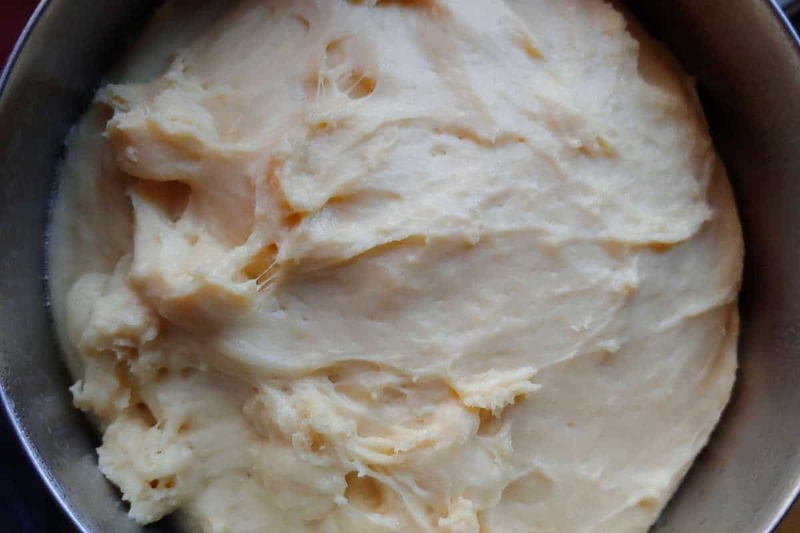 Frosting may be made in advance and stored in a separate freezer bag. Thaw with the cinnamon rolls. Bring to room temperature when the cinnamon rolls bake. Frozen dough will last at least 4 weeks. I always make these for an overnight rise, so that I can have cinnamon rolls first thing in the morning. I also usually freeze half of the rolls, before baking, to have on another day. 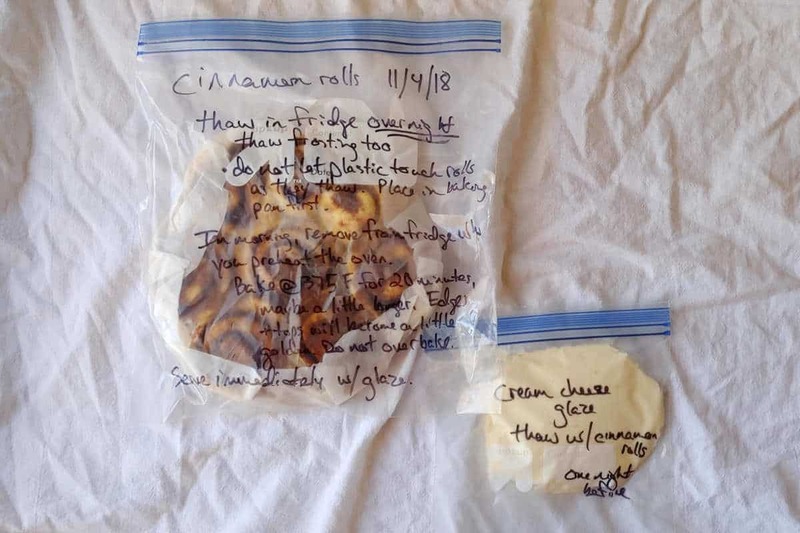 Always label your frozen rolls with any baking instructions (thaw the day before in the refrigerator, bring to room temperature while preheating, bake at 375F for 20-30, instructions for frosting) so you don't have to search for the recipe later. Do not add too much flour to the dough or it will be stiff and hard to work with. The rolls will also not be tender. I find softened butter, rather than melted butter, to be best to spread over the rolls for the filling; it is less messy.